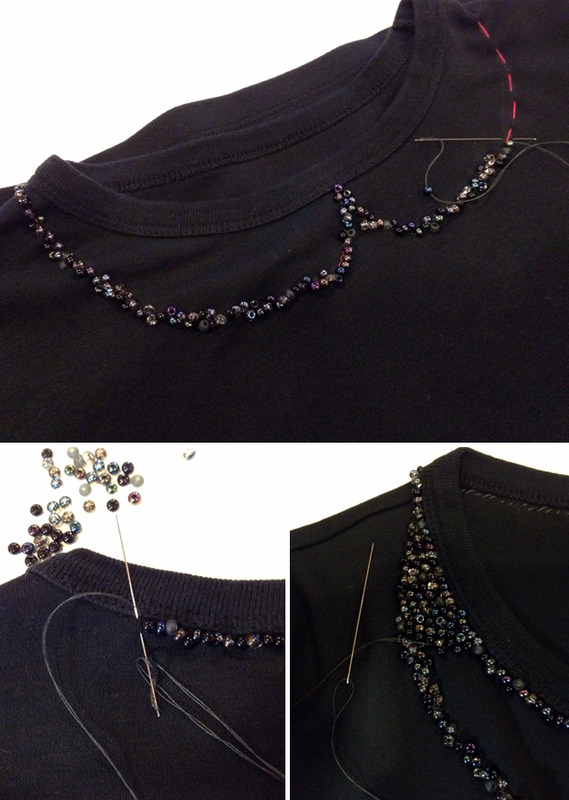 Turning a boring ol’ t-shirt into an embellished masterpiece is as easy as draw, outline, and fill! Let’s get to it. Before starting, I recommend giving the shirt one last machine wash. You’ll probably want to handwash your top once the collar is complete. 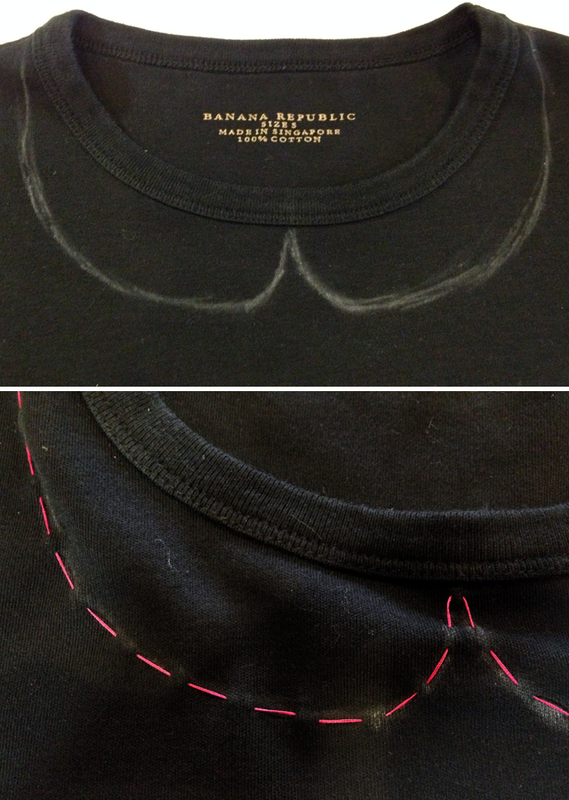 Draw an outline of your collar directly onto the t-shirt using your fabric chalk. I free-handed mine, but tracing a pattern is always an option. Don’t be afraid to try out different sizes and shapes until you find something you like. A damp cloth will erase the outline if you want to make adjustments or completely start over. I drew a smaller collar in the beginning, but ultimately decided on something more substantial. Once I was happy with my sketched-on collar, I used the contrasting thread to sew on an outline. I figured that as I beaded, the chalk would rub off (which totally happened). While this step might seem redundant, it will save you from re-drawing your outline over and over as you begin to sew on the beads. 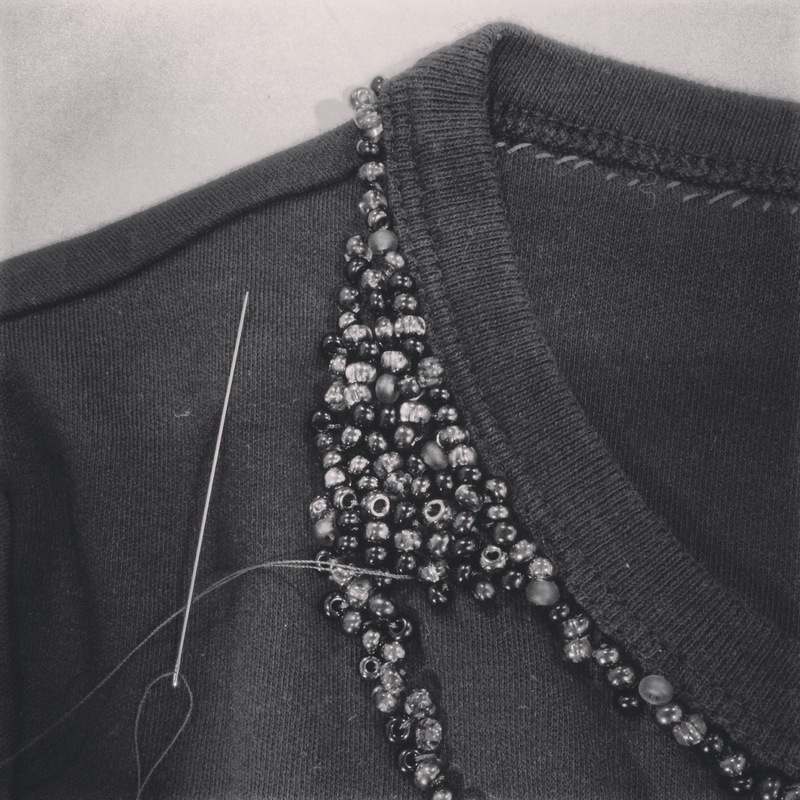 Your collar is outlined and your beads are assembled, so it’s time to start sewing. Pick a point to begin beading and just go for it! I doubled my thread for extra hold and sewed on one bead at a time. Make sure your knots are nice and secure, and every so often, gently tug on the fabric to make sure that the beading will stretch. I had this nightmarish vision of pulling the t-shirt over my head, hearing a pop, then watching helplessly as beads tumbled to and bounced all over the floor. Kinda like this. 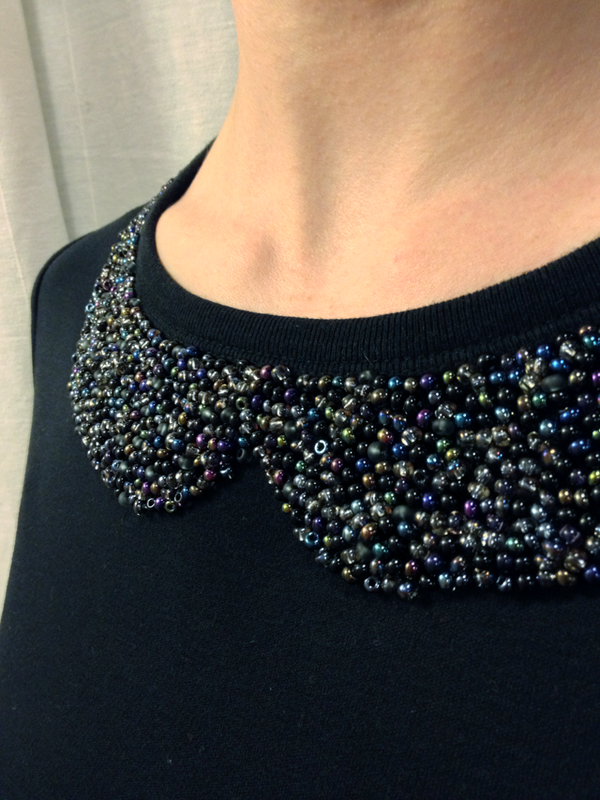 Once I had beaded around the entire collar in the front, I sewed a single row around the back of the neck. It’s totally optional, but I’m a fan of even the smallest details. The final, but most time-consuming step is simply filling in the collar. Just as you did for the outline, sew on one bead at a time and stretch the fabric every once in a while. I took the opportunity to add a bead or two to the outline itself, creating a smoother and more polished edge. Like I said, it’s a very simple project and totally worth the time spent. If you use this tutorial, please send pics to folklorecraft (at) gmail (dot) com! I would be honored if you shared your creativity with me! Moving twice in 11 months will certainly prompt you re-evaluate your wardrobe. Why pack, move, and unpack something you haven’t worn in ages? Why fill your closet with clothing that’s out-of-shape, the wrong size, or just plain uninteresting? My friend Sarah, the Fröhliche Haus Frau, recently blogged about her experience downsizing for her move across the Atlantic. It’s tough and sometimes heartbreaking work, but completely necessary if you wish to maintain a polished wardrobe and your sanity. Trust me. Even though I’ve made a concerted effort to maintain a slimmed down closet, a few items always seem to fly under the radar. 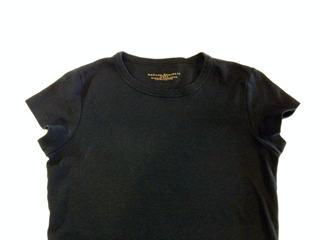 I recently discovered this black t-shirt stuffed in the back of a very neatly folded drawer. How?! Why?! Alas, I had no answers. I honestly can’t even remember the last time I wore it. Not good. Rather than toss it into the donate pile, I decided to give the shirt one last chance. 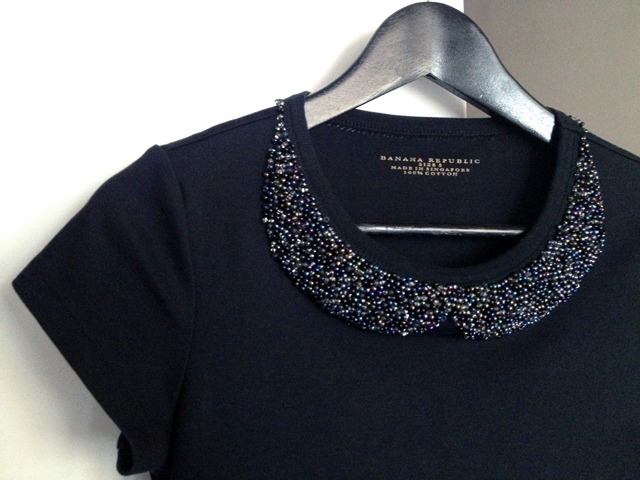 The high neckline made the tee the perfect candidate for a peter pan collar – so hot right now. * I toyed with the idea of sewing a collar, but DJ encouraged me to try something new. I went out on a limb, and by that I mean to the craft store, and took on the task of beading one instead. The project was surprisingly simple, albeit time consuming. I worked on the collar over the course of a few nights, but I think the results are definitely worth the time invested. 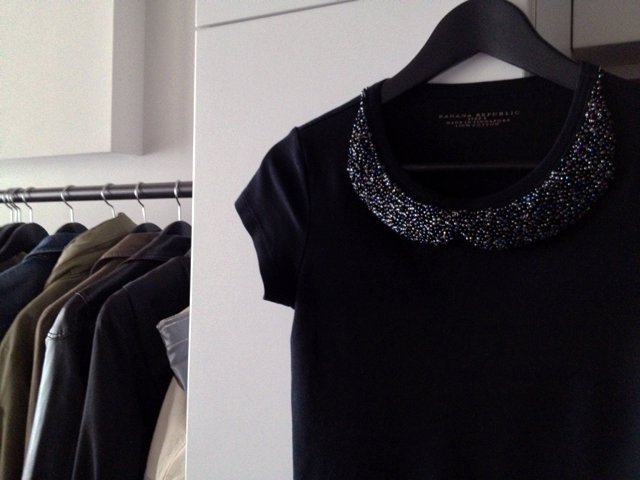 Plus, what’s easier than throwing on a t-shirt with a built-in necklace? I took some pictures along the way, too, and I’m considering putting together a tutorial. Anyone interested?